It was my mother-in-law's birthday last month so I thought I'd try out the Big Top Cupcake set that my son had given me as a gift awhile back. My mother-in-law doesn't go for chocolate and the rest of that side of the family has various dislikes. To keep everyone happy I made a yellow cake, filled it with a creamy white filling and frosted it with buttercream. So that it didn't look plain, I made a rainbow cupcake. What didn't work: The rainbow thing. It wasn't a disaster but it wasn't exactly what I was going for. 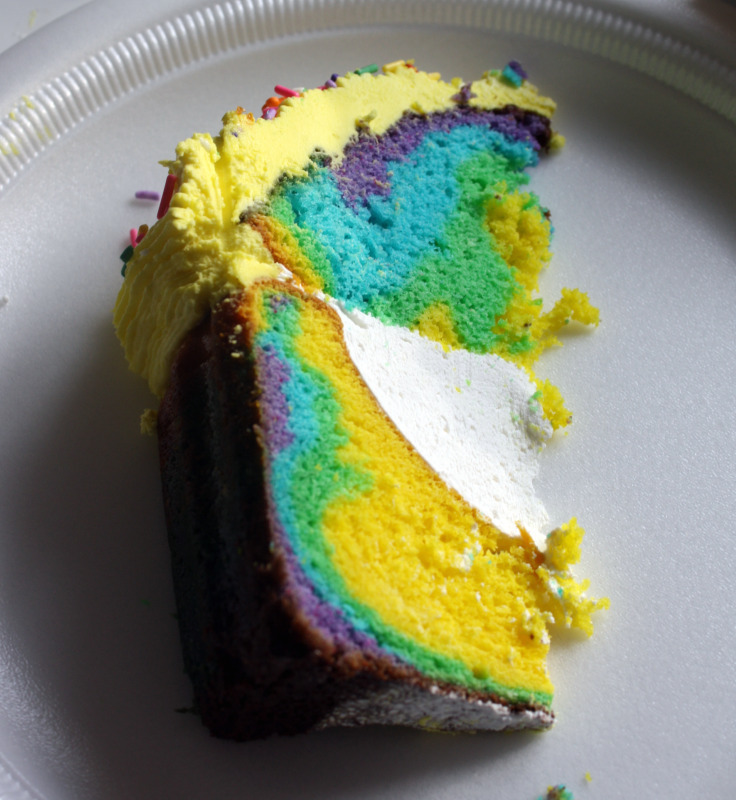 The basic idea for a rainbow cake is to divide your batter into bowls, one for each color you're using. I had a set of four gel colors from Williams Sonoma, so that's how many colors I used. Color each bowl of batter with a different color. Drop one color of batter in the pan, tap it to let it spread a bit, then keep adding batter on top without mixing or swirling. In the end, the pan of batter looks like a multicolored bullseye. This batter, however, was thick so it didn't spread out like most thin cake batters. I tried using a spatula to get it to behave, but it didn't work exactly right. So the result was colorful, but not a rainbow. 1. The cake, filling and frosting. I'd highly recommend all three recipes. The cake was one of the best I've made -- moist, somewhat dense, buttery, not too sweet -- not at all what you'd expect from a cake that started with a boxed mix. The filling tasted just like the stuff in packaged baked goodies -- maybe better. And the frosting -- yummy. 2. The Big Top cupcake set. 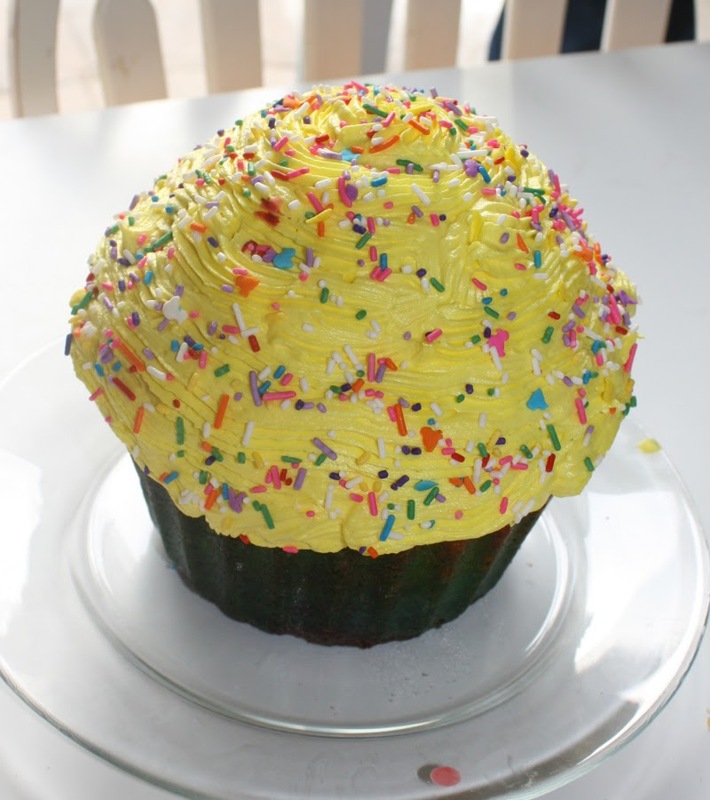 It did look like a cupcake, although not as big as you might imagine. I've included some hints in the recipe, below. Place a rack in the center of the oven and preheat the oven to 350 degrees. Generously spray the insides of the pans with cooking spray. Set the pans aside. Divide the batter between the molds, about 2 cups in each. Place the insert (which also has been sprayed with cooking spray) inside the bottom mold and make sure the insert overlaps the sides of the mold. Place on a cookie sheet and put into the oven. Bake the cakes until they are golden brown and spring back when lightly pressed with your finger, about 45-50 minutes. Remove the pans from the oven and place them on wire racks to cool for 10 minutes. Unmold, then allow them to cool completely, 30 minutes more. If you have time, wrap with plastic wrap and freeze until firm to make it easier to fill and frost the cake. Then fill the cake, put the top on, and frost. I frosted only the top part to make it look like a cupcake. Makes a little more than enough for the Big Top Cupcake. Use the extra for a dip for fruit or graham crackers. Dissolve the salt in the hot water and allow to cool. Whip the marshmallow cream, shortening, powdered sugar, and vanilla until it begins to get fluffy. Add the salty water and whip well. In a standing mixer fitted with a whisk attachment, mix together sugar and butter. Mix on low speed until well blended and then increase speed to medium and beat for another 3 minutes. Add vanilla and cream (and gel food color, if desired). Continue to beat on medium speed for 1 minute more, adding more cream if needed for desired consistency. I used a large star tip to pipe the frosting on the cake. Looks pretty colorful, even if it wasn't the result you were hoping for! My boys would be thrilled to have a "giant" cupcake cake! That's a cool idea -- I think it looks pretty great even though it wasn't what you were expecting! I've been wanting to buy one of those giant cupcake molds. Rainbow is likely easier to do with the traditional sort of cake, but I'd say yours looks pretty darn good. Love the cream filling idea. While it may not be a rainbow it has definitely got the "cool-tie-dyed" look. I love it. Looks so scrumptious. My kids would be so WOWED by this cake! I personally think that is looks great! I have always been wanting to try my hand at doing the rainbow cupcake but im a little intimidated. I perhaps shall give it a go! This is fabulous! I just bought one of these and was looking for ideas. The filling is great, but I especially love how your coloured swirly thing turned out! 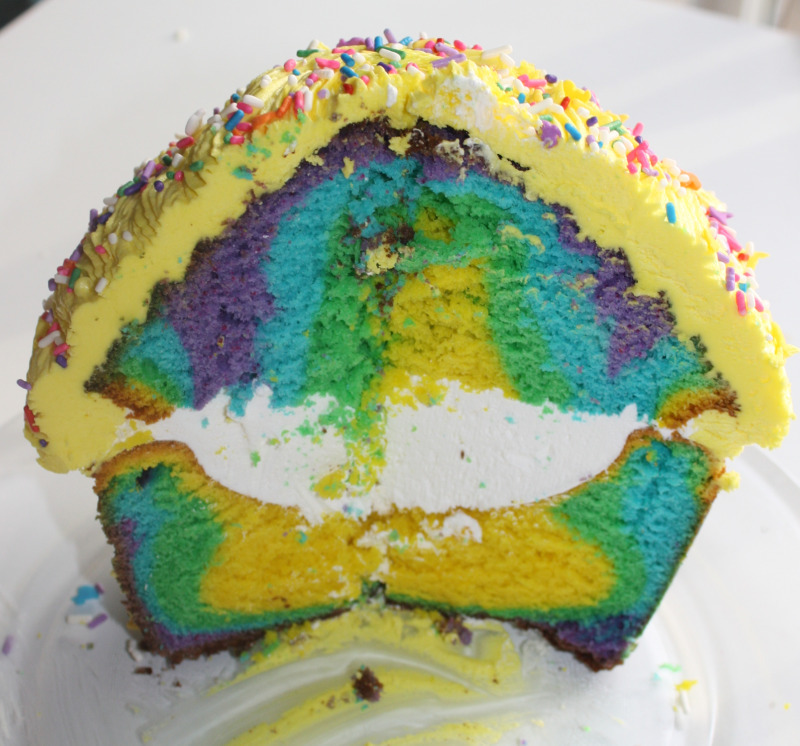 i love the rainbow looks fab :D and im gunna use your receipe for the yellow iced cupcake. I tried the grandmas recipe that is in the booklet that came with the mold but it came out really greasy, it was quite heavy to eat and shiny ?!?! any ideas ? ? I haven't tried any of the recipes that came with it so I don't know why it didn't work -- sorry! Thanks to all of you for the rest of the comments! It looks great, I'm making 3 for NYE does anyone have a good recipe for chocolate cream filling? I haven't made it yet but several comments online stated they used the directions on the regular cake box and they used Pillsbury. Does anyone have a preference for what they have tried? any suggestions would be great, I'm not the best cook or decorator. I personally have not used a chocolate filling. I recently filled cupcakes with a chocolate chip-cream cheese mixture that was yummy. Just take a cream cheese frosting (there's one on this blog) and mix in mini chocolate chips. Glad I found this - recipes for the Giant Cupcake/Big Top Cupcake maker are hard to find! Looks good.